Discussion in 'Houston Texans' started by Castor27, Jan 7, 2019. I know. There are only 5 teams. 5 starting centers. John, we feel real comfortable with Lamar and Alfred. Great combo. Both work hard, getting better every day. We're not looking to add any running backs at this time. Am I the only one that read this with B.O.B's voice in my head? ramotadab, Mr. Clutch, Htown Legend and 2 others like this. ramotadab, joshuaao and red5rocket like this. I heard Gomer Pyles voice. I think this was expected by everyone. Another $14M to play with. That would be nice but at what price? We've already heard 49ers from Jerry Rice. He's got to have more than one team on his list though. ramotadab, HstnSprtsFan101 and red5rocket like this. Texans have been #blessed with non-diva WRs. ramotadab, Pringles, Roc Paint and 2 others like this. Jacoby is as close as they've gotten. 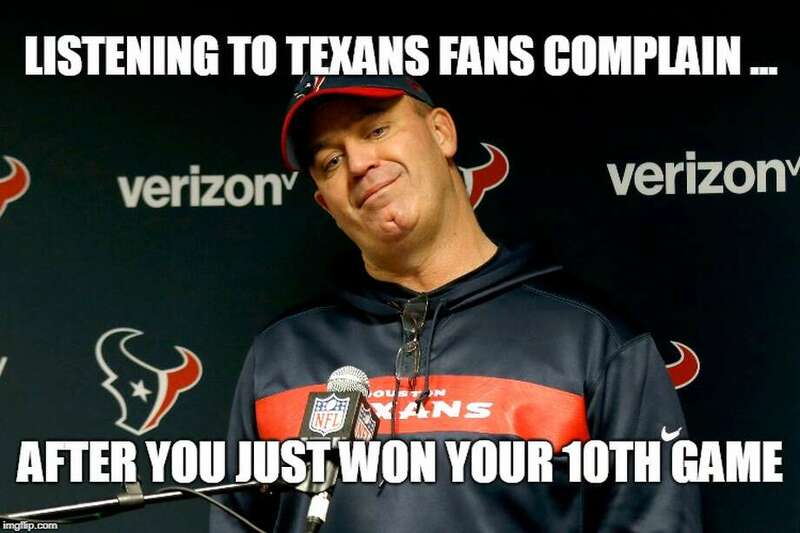 This is going to be the attitude at Reliant for at least the next 12 months. mario_v and Pringles like this.